I’m very glad to announce that Alfstore has been selected by Alfresco Software as an Authorized Training Partner for France. This new partnership has been announced by Alfresco during the Paris Alfresco Day 2012. Only Authorized Training Partners can deliver Alfresco classes based on course material developed by Alfresco itself, so this is a great opportunity for us and our customers. We do have 2 certified Alfresco trainers on our staff, and we are now ready to cover France, Western Europe, and Mediterranean Countries. Basically, You have the choice between two options: we can deliver the course at your own site, or you can register for a public course at our own training facilities. If you want to train your team (at least 3 people), we can also deliver at your own site. In this case, we can adjust the training level and duration depending on the participants’ experience and objectives. You can select an existing course and ask us to add any customization that your team requires. You can even build your own course if needed. Want to know eveything about the Jive and Alfresco integration ? 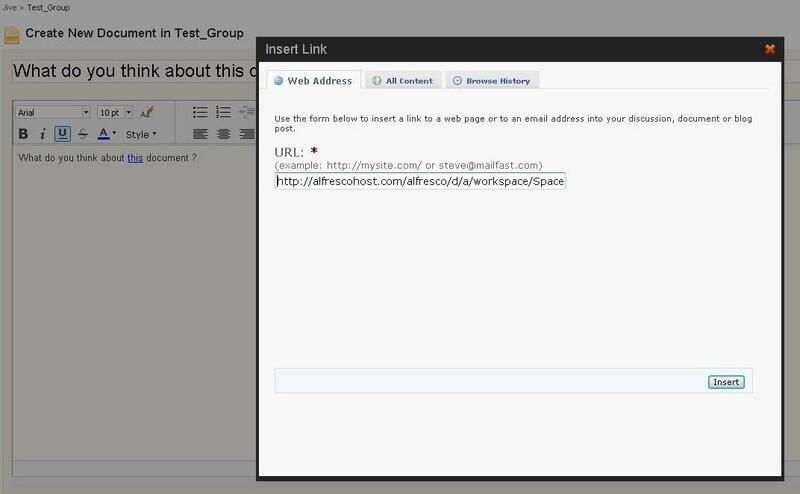 With this new Widget provided by Alfstore (www.alfstore.com), Jive users can now work and collaborate around Alfresco documents using Jive social features. 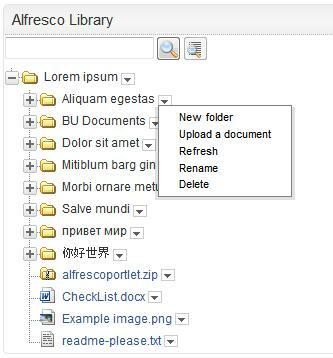 Alfstore has just released the version 2.0 of the Alfresco Portlet for IBM WebSphere Portal. If you are looking for a desktop client to manage your Alfresco documents, you should evaluate the Fred application. I saw a demo by Xenit during the last Alfresco DevCon, and this desktop client has really some good features, especially off-line document management options that are unique to Fred (as far as I know). Our company (www.alfstore.com) just delivered a new Widget component to integrate Jive (Enterprise Social Networking solution) with Alfresco ECM platform. It’s a little bit too early to speak about this new Widget component features and its roadmap, but of course we plan to build an Enterprise supported version, for other customers. So this post is not about the Widget itself (yes more technical communication will come later on), but about all the thinking that lead to the current v1.0 design, and why we have selected this approach to start with. I think this might be of interest because this could apply to other similar projects of integration between Social Software, and ECM (not only Jive / Alfresco). – For a new document (available on my desktop) : should I publish it in Jive first or in Alfresco first ? – What about existing documents ? If the document is already in Jive, when and how (and why ?) should I push it to Alfresco ? – If the document is already in Alfresco, how can I push it to Jive ? – If I add a tag, a rating or a comment on an existing document, should I synchronize also this meta-data to the other system along with the doc binary ? – When a document is moved from one system to another, should I keep a copy or a reference in the source system ? So we had to address some infra/IT questions, as well as functional questions…But the main question to answer first was: where should I finally store my document and/or data ? Actually, the answer to the previous question is quite obvious (at least for me). Yes ESN systems are used to manage a lot of data (documents, images, video, etc)…but they are usually not designed as highly scalable data repository. They are primarily designed to improve collaboration, and to ease social networking. Think about your youtube video : you will upload them first in youtube (youtube is the highly scalable storage), and then exposed them in your web site. So you can consider Alfresco as the youtube for documents, and Jive as the front-end application that needs to expose documents to allow collaboration. So it was clear for us that the final document and data repository should be the Alfresco ECM system…But now, more and more, conversation will start in the ESN system first….how could we manage that ? Actually, the good question about storage location and responsibility might be where should I store my documents in the short, middle or long term. – Short term: for a new “draft” document, the first storage location could now be ESN. The “document” could be already a draft document (word, excel, etc), but it could also just be a web piece of content (blog post, wiki page), or just an idea (forum discussion, comments). – Middle term: once the document is “finalized”, it should be moved to the Document Management system (ECM). Document can still be modified, but less frequently. Security/Control are important here, because we need to have fined grain control on the reader audience. – Long term: for long term storage, you might need to move the document in an archiving system. So yes, you finally will have to deal with long term storage strategy/archiving, retention policies, security policies, etc…I know it’s not as fun as doing social networking, but you need to take care about your documents. You need some form of control to keep and manage this company knowledge in the long term so that someone else (another employee) could securely but easily find it, and could re-use it. – User should store it in ECM (Alfresco) first. – From Jive, browse your ECM document library (using our Widget of course ! ), get the ECM document reference (link) and use it to start a discussion, or include it in any ESN item (blog post, wiki page, etc). – It could be uploaded in ESN tool first (could be a draft, but it could also just be a web piece of content, or just an idea). – Once the document is “finalized”, it should preferably be moved to the ECM system (Alfresco). – Collaborate around document (using the ESN tool). Basically, you need to build an ESN view component (Jive Widget in our case), and then use appropriate framework to build the dynamic view (Struts, YUI, etc). For those who are familiar with Portal, a Widget is functionally “similar” to a Portlet. 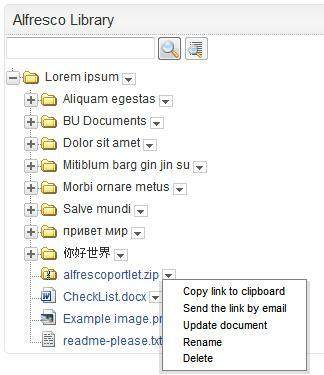 You need at least to implement the basic document management feature (create, update, delete, rename, etc), and to expose them in the ESN interface (Widget). This can easily be done using one of the Alfresco Web Services (REST, SOAP, CMIS, etc). 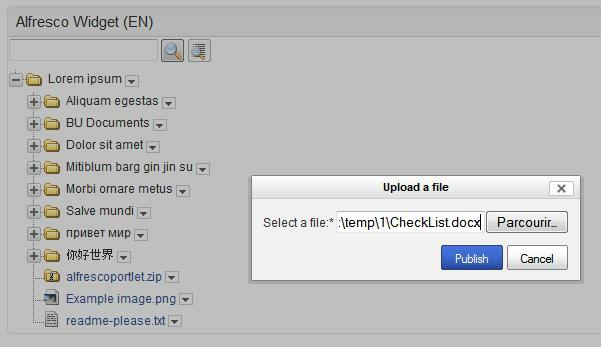 For instance, you need an upload “wizard”, to put document in Alfresco, directly from the Jive web interface. The purpose of this feature is to move the document binary from the ESN system to the ECM system, once it has been finalized. This “Move To” feature has not been implemented for the moment, in the v1.0 of the Widget. Actually, it was quite complex to manage (as Jive is not open-source), and you need to have full control on the ESN code and data model to implement it. Also, there are several options to do it (duplicate file binary, keep meta-data in ESN after the move operation, remove meta-data from ESN, etc). We had limited time to deliver v1.0, and wanted to keep the system as much simple as possible, mostly to avoid any painful upgrade due to big system customization…Anyway, this feature will likely be scheduled for v2.0. Note: if you want an example of such “Move To” feature, you can have a look at the existing IBM Quickr and Alfresco integration (more info). The scenarios described above have already been implemented by IBM/Alfresco (duplicate, detached, etc). And the last scenario is “collaborate around document” (see section below). In our scenario, collaboration around the document is managed in the ESN system (tagging, rating, comments, discussions, etc). When the document is uploaded directly in the ESN tool, then it is quite easy to do: your ESN system usually provides mechanism to collaborate around its own objects (whether it is a document, a blog post, a wiki page, a news, etc). But when document is stored in the ECM, you need to find a way get its reference (nodeID, URL, etc) to refer to it from the ESN system. – We wanted to be able to use the ECM doc reference (Alfresco nodeID) in all kind of Jive object (Jive Documents, Blog, Wiki, Discussion, etc). 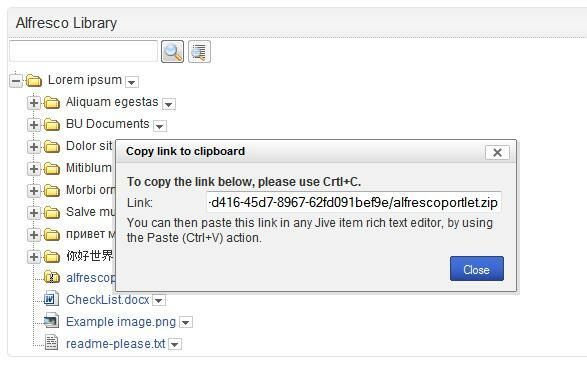 – Then he/she creates a new Jive Object (Jive Documents, Blog, Wiki, Discussion, etc), and paste the link in the corresponding Jive HTML rich text editor, using the standard Jive insert link wizard. Yes it’s basic, but it works well :-)…and also it is very easy to maintain (no Jive code or data model customization here), so no regression expected during the Jive software upgrade. For the next version of the Widget, we might consider using the new Jive activity stream feature…to provide a more integrated experience…to be studied. 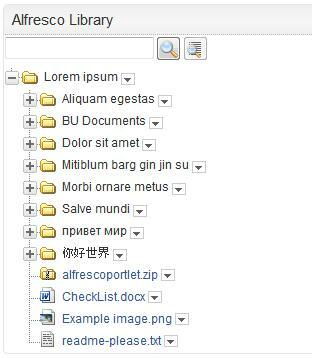 This Widget component is a first example of how the Alfresco/ECM foundation could be integrated with ESN/Jive system. It’s a first step, we know we can do much more with social software integration. So what are the next steps ? This v1.0 of the Widget is deployed in Jive production environment at customer site, and used by thousands of users. We are waiting for customer feedback to gather evolutions request, and improve next releases. We are planning to build a GA Enterprise version as soon as possible, for other customers.